Escaping Perpetuity follows a female figure caught between the gaze of the camera and the resistance of an obstacle that literally and symbolically blocks her path. 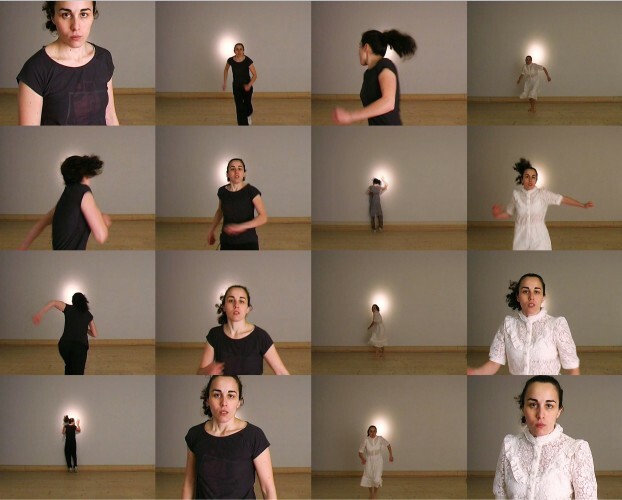 Initially, the woman confronts the camera, directly returning the viewer’s gaze. She then turns, runs and throws herself at a point of light on the wall behind her, only to collide with it. The light on the white wall establishes a contrast between the optimistic connotations of ascendance, achievement and hope vs. the literal block of opposition positioned between her intention and her trajectory. Despite the roughness of her collision, the figure returns to the camera to confront it again. She then turns and runs towards the light, repeating the challenge only to find the same resistance. She undauntedly begins again, facing off both physically against the obstacle and psychologically against the gaze of the camera. This becomes a choreography of frustration and endurance. The resistance of the wall is met again and again by the agency of the woman’s unwillingness to give up. In her third attempt, the female figure’s black sportswear transitions to a white, high collared lace dress. The garment is overtly feminine and childish and conveys both restrictiveness and vulnerability. It evokes a catechism dress or a garment loaded with expectations for behaviour and appearance. Within Urbano’s critically and socially engaged works, this can be read as a commentary on constructed gender roles imposed socially on women in contemporary society, as well as the barriers systematically faced by women of colour. This is extended to object-like positioning expected toward an external gaze, an expectation Urbano thwarts. In this work, the female figure meets the viewer’s eye in an action that can be coded as assertive and confrontational. This can be contrasted with the heroic power the same action could take for a male protagonist of an action film, for example. In this way, Urbano plays with the expectations of the gaze on the female figure in this work, as well as reveals the multiple constrictive barriers she faces. As the work unfolds, the barefoot figure continues her confrontation of both the camera and the obstacle wall, conveying that it is becoming more pressing and more impossible. Visibly exhausted, the viewer witnesses her as she backs slowly from the camera after her last collision. Her eyes fixed warily on the viewer, she walks slowly into the light until her back is to the wall there is no further point of escape from the gaze of the camera. The light, which was the focal point of her impact with the wall as obstacle, becomes a hallo around her. She no longer struggles against the constraints imposed by garment and expectation of her behaviours, but rather has found “her place”, the place socially designated for her symbolically and traditionally within the literal framing of women on film, and arguably, still existing within contemporary society. The cycle the figure is trapped in, or the Perpetuity as described by Urbano’s title, is revealed through this work as frustrating, daunting and urgent: an obstacle and environment to be challenged directly by the resolve in the woman’s eyes. This entry was tagged duality, Migration, video.